The Dallas - Fort Worth metroplex (DFW) is the 4th largest metropolitan area in the U.S. Unfortunately, it is not know for having good public transportation. However, what it does have in abundance is a huge system of highways and toll roads. This vast multi-lane road system is connected with some of the highest overpasses and bridges imaginable. From a distance they often look like a vast roller-coaster of interweaving and high flying launching ramps. One thing is for sure, the architects who designed them did not have any driving phobias. For individuals who have developed a driving phobia, also known as vehophobia, DFW can be a frightening place to drive. The cities within DFW are so spread out that the highway system is nearly unavoidable. For instance, if you lived in McKinney, Frisco, Allen and you needed to go to Highland Park or Dallas, well good luck getting there without getting on the highways. It could take hours via the back roads. What if you lived in Garland, Rockwall or Rowlett and needed to get to Irving, Lewisville, Flower Mound or Denton? Again, you could spend much of the day traveling if you had a fear of driving on the freeways. 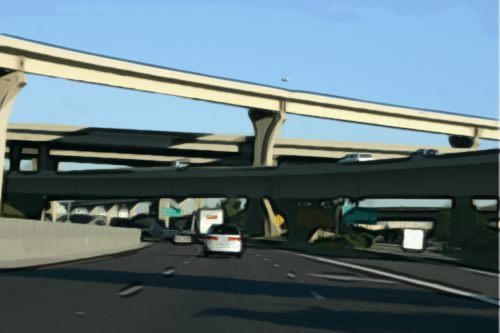 My clients from Plano and Richardson, Texas battle two of the largest highway and overpass complexes in the Dallas area. One is the intersection of the Bush Turnpike and U.S. Highway 75. 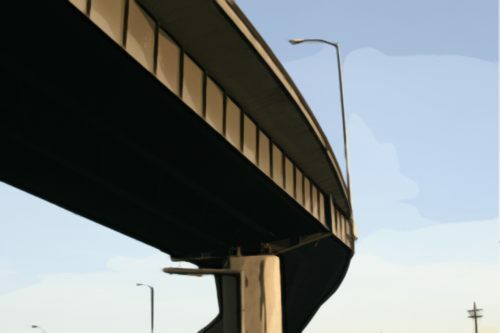 The other is the infamous "High 5" where U.S. Highway 75 intersects with LBJ Freeway (635). There is plenty of fuel for the fire of anxiety in DFW if you suffer from one of several types of driving phobias. Although people can certainly develop a driving phobia that relates to small local roads, most of the people that I treat have some combination of the situations outlined above. These conditions can trigger intense anxiety and even panic attacks. For many people, the stress of their work and their lives is almost more than they can handled. However, for those who also suffer from driving phobias - whether bridges, overpasses or highways, etc. - the extra stress from having to deal with driving can become overwhelming. Feeling overwhelmed from a buildup of cumulative stress can contribute to the formation of phobias in the first place or it can cause a fear response to spread to new situations. Many of the people that I have worked with in therapy have had such powerfully intense bouts of anxiety that they were startled by their physical symptoms. The sensations of distress in the chest were so strong that they actually thought that they were having a heart attack. Of course after emergency room visits, they were reassured that their heart was fine. However, they had experienced a panic attack. Panic attacks are so traumatic for people that if they occur while driving one or more of the driving phobias can form. I have observed driving phobias forming in one of two ways. A driver experiences an acute high stress event. This could include an injury auto accident, an accident where the motorist feared that they would die or any other driving related situation where the fear of injury or death was extreme. This could include one's car being caught in high water for example. A person's stress load has gradually built up to a breaking point. Then, some stressful event happens while driving and that stress combined with all of the previous life stress culminates in feeling overwhelmed and emotionally flooded. These are the "last straw" threshold events that push a person beyond their coping capacity. The resulting effect is a moment of panic and the imprinting of intense fear in the emotional midbrain. When this happens, the alarm center of the midbrain becomes conditioned to set of the alarm if any reminder of that stressful event takes place. From that point on, the midbrain makes a mistake and sets off a false alarm response in those driving conditions. Your sympathetic nervous system is activated and you begin to feel all of those unpleasant symptoms of "fight-or-flight" that you associate with the fear of driving. A driving phobia is born. I have developed a precise three step treatment process that is helping people to overcome the fear of driving. I have the person I am treating take videos of challenging driving conditions. OK, sometimes, their spouse or a friend will take the videos for them if they are too uncomfortable to even do so as a passenger. Then, I can have them watch the videos in my office as we work with the treatment methods mentioned above to desensitized the distress related to the videos. Once we have treated the old painful memories regarding driving and then treated the reactions to videos of challenging driving conditions, then we are ready for the last phase of therapy. This is where we take the treatment to the streets. It involves three parts. Starting with small challenges and working up to more daunting ones, you will begin to drive in those previously uncomfortable conditions. Using multiple exposures to the same section of highway or bridge, with every repetition of a test drive your midbrain will learn to associate self-soothing techniques and calmness with driving. In therapy sessions, we will debrief about your therapeutic homework assignments. Here I will provide additional desensitization therapy as necessary to make it easier. If there are any automatic negative thoughts that interfere with your comfort or progress, then we will treat those thought with cognitive therapy interventions. All of these therapy components, if done precisely and repeatedly, can result in a return to comfort while driving. Driving phobias no longer need to get in your way of work or recreation. I have successfully treated many people who are now free from driving phobias. I look forward to being of help to you as well.